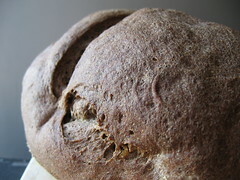 Velvety Buckwheat Bread - Do You Know The Muffin Man? Notes: IMPORTANT! There is a mistake in the early printings of this book for this recipe. You should use 2/3 cups water plus ¾ cup sour cream in the sponge. See the errata list for details. This bread is a variation of the Basic Hearth Bread I made last week. I made the sponge and let it ferment for about 18 hours in the refrigerator, then shaped the loaf into a freeform round. 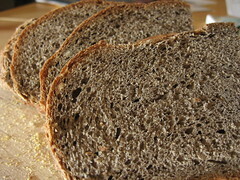 It has a deep brown colour, as I used dark buckwheat flour, and it tastes distinctly like that grain. The texture is very soft, but I can't say that I really enjoy the taste.